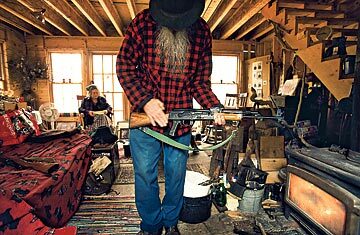 Author Carolyn Chute reads letters while her husband cleans her AK-47. In early October, the Second Maine Militia opened its meeting with the traditional shooting of the televisions. The 50 or so "members" (there are no rolls and no one pays dues) chatted quietly as the blasts rang out. A small cannon was fired into the woods, parting the trees and shaking the windows of the house nearby.